Since it has been skimmed off the best milks that our cows produce, our cream is a refined product and carries PDO status with its Protected Denomination of Origin. Our cows live peacefully in the open air, fed almost entirely on grass: this is what we get in the taste of the milk that they supply. The reason why it is literally out of the ordinary is that on this exceptional terroir, the cooperative has developed know-how that can be found nowhere else. Our Isigny PDO crème fraîche is made the traditional way. Milk is skimmed so as to obtain the required fat content, before being gently pasteurised. It is then sown with carefully selected lactic starters. To meet the requirements of the technical manual, nothing is added or removed. But above all, the Isigny crème fraîche benefits from a long, slow ripening period, during which it rests for between 16 and 18 hours. There is a lot of skill at the fingertips of our production hands, but it is their patience which counts. It allows flavours to develop fully and lets our cream excel. During this time, our PDO Isigny crème fraîche comes into its own and acquires a silky smooth texture, takes on a rich ivory colour and develops the thousand and one aromas for which it is prized by gastronomes! Delicate and rounded in flavour, Isigny PDO crème fraîche is one of the few to display a fat content of 40% fat in dry matter. 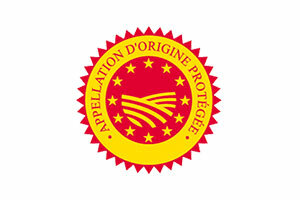 The European system of Protected Denomination of Origin (PDO) has its origins in a French system that recognised and identified products which typified a given terroir and traditional producers’ know-how. 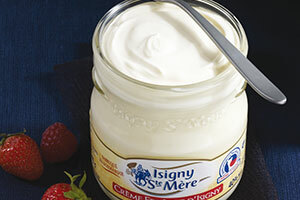 Isigny crème fraîche has been awarded PDO status, conferred by a decree of June 30, 1986. This is an official mark of quality. First of all, it guarantees that the cream has been made locally from authentic milk produced in the terroir. It comes exclusively from pasture-fed cows in a zone made up of 192 communes, 109 in the Cotentin département and 83 in the Bessin area. Only this milk with its unique nutritional profile, rich in beta carotene and iodine goes into the making of PDO Isigny crème fraîche. 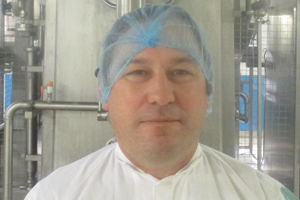 Norbert Constant, our Master Dairyman, the person who takes care of the production of the cream production. First of all, he checks the quality of his raw material: the milk. The cream is taken off. The aim is to obtain a minimum 35 %. 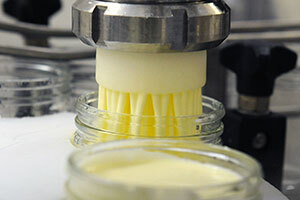 During the next stage, we add lactic cultures which are “sown” in the cream. The composition of these cultures is one of the master dairyman’s closely guarded secrets. It is none other than the key to unlocking the unique aromas of Isigny PDO crème fraîche. Finally, master dairyman directs the maturation process. He has to check the time of maturation as well as the temperature, (it rests from 16 to 18 hours in a temperature of 18 ° in 22 ° Celsius) to obtain the qualities which Isigny crème fraîche is famous.